Chongqing’s modern history began in 1890, when it opened as a treaty port, though not many foreigners made it up the Yangtze River to the city. It wasn’t until the invasion of the Japanese that Chongqing became a major centre. As refugees flooded in from all over China, Chongqing’s once small population grew to over two million people. Today, many of Chongqing’s sights are connected to this little bit of history. Chongqing is a growing metropolis, China’s 4th largest directly-controlled municipality after Beijing, Shanghai and Tianjin. The area has an abundance of natural resources: minerals, lush verdant forests, water reserves and thriving species of flora and fauna. Situated near the magnificent Yangtze Three Gorges Dam, Chongqing attracts visitors not only interested in sightseeing, but in shopping as well. While killing time before a Three Gorges cruise, a city walk will inspire amazement at the massive developments in this city. One sees old homes awkwardly nestled amongst the modern skyscrapers, and stick porters with baskets full of wares making their way to market, parallel to Chongqing’s gleaming new light rail system. Nestled in hills, overlooking over the convergence of several rivers, the municipality is foggy during the day. 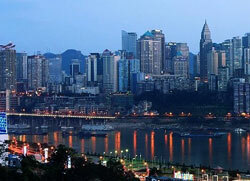 Come night, Chongqing comes alive with roving lights and flashing neon signs. Chongqing’s attractions include the 9th century Dazu Rock Carvings, the old quaint old village of Ci Qi Kou, as well as the site of an ancient battle field (the Fishing Town). Chongqing has a good reputation for its spicy Sichuan cuisine and delicious hotpot dishes. Those looking for a bit of adventure should try the spicy delicacies served by street vendors found all over the province.